Every morning I get up a few hours earlier than everyone else and have my coffee, meditate, pray and reflect. Today I am reminded of something that happened in 2010 that I’d like to share with you. It seemed like every few days (while driving here and there) I would drive past this billboard that would grab my attention. Have you ever had that happen? As if this billboard was scattered throughout different places and were put there just for you? Ok, maybe that’s not the case but it sure seems that way when something draws our attention and speaks to us out of the blue. Last year was a very difficult year for me and my family. Trying to adjust to a new way of life in Chicago, experiencing financial difficulties and all sorts of challenges yet every time I would get into the car and drive to an appointment, an event at a business, or just the grocery store I would see this sign “FEEL THE DIFFERENCE FAITH MAKES and I would be reminded to have faith, even and especially when circumstances are screaming quite the opposite. If you’ll allow me (and since it’s MY blog) I’d like to share a little of my devotional from this morning that addresses this. This entry was posted in encouragement and tagged believe, billboard, encouragement, faith, faith in caring, perservere, trust. Bookmark the permalink. Like a deer caught in the headlights of worry and doubt. 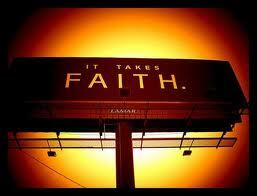 When you put in the hands of faith, you feel the difference for sure. I know what you mean, my friend! I have been in that place for several years. If allowed, it causes us to continue to press past the difficulty, the things we can’t see or the unknown and to totally be dependent on a greater force at work.